Military personnel may one day be able to get personalised day to day support for their busy lives thanks to a new project being delivered in response to a MOD Funding Competition. The project is being led by us in collaboration with Altruist Enterprises and the Institute for Employment Studies. Daden and Altruist are both based at the Innovation Birmingham Campus. The competition was run under the auspices of the Defence and Security Accelerator (DASA), sponsored by the Defence People (which sets the strategy for developing a capable and motivated military and civilian workforce within the MOD). The initial contract is worth £247,720. 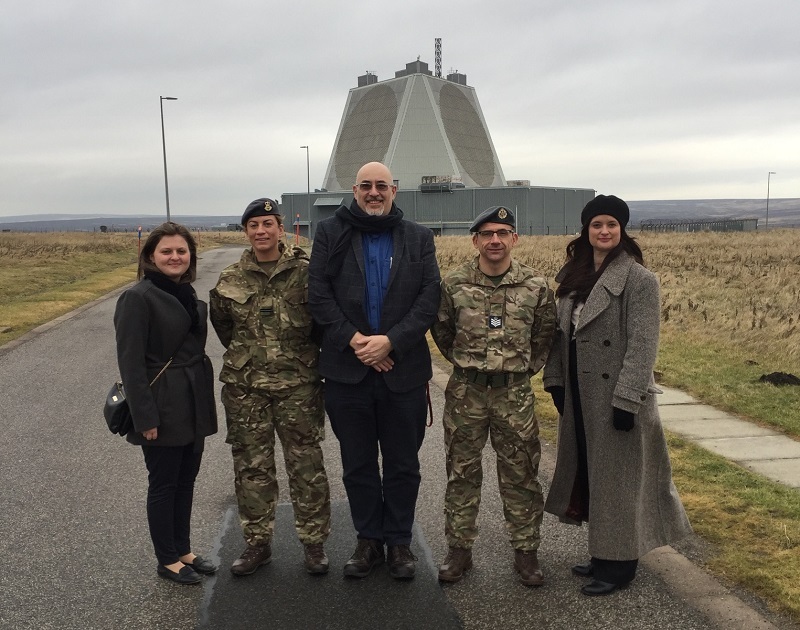 The project aims to develop a mobile chatbot application with the intention of trialling it at RAF Fylingdales in North Yorkshire. In creating the application and content the team are working with the military users and managers to identify what support is needed, and also what other information and functionality would encourage personnel to use the application on a regular basis. Military life can require high levels of resilience from Forces’ personal with lengthy separations, frequent moves, deployments, shift-patterns and operational duties all adding to the load. It is hoped that the app will help to reduce the friction of day-to-day military life, improve mental and physical health, well-being and resilience, support personal planning and development, and ensure that military personnel are more informed, motivated and fulfilled. The app, which builds on previous work by us and the University of Worcester for the MOD, is designed to work on personal mobile phones and provide personnel with quick, direct, 24/7 access to information and support resources to help both them and their families. The app can also take a more pro-active role, offering up suggestions for short training sessions to help build resilience and well-being, to improve sleep, to manage stress, and to plan future personal development and career progression. It is not intended that the app does everything itself, rather it helps signpost users to trusted and appropriate web and mobile apps and resources, and of course to human support when that is the best way to deal with an issue. RAF Fylingdales Station Commander Wg Cdr Alun Walton said "The virtual life coaching application will allow RAF Fylingdales serving military and families to engage with different aspects of modern life by embracing ever-present technology. This is a real step in the right direction for welfare and resilience and we look forward to contributing to the development of the application for all of Defence in the future." The current development phase of the project runs until May 2019, when hopefully approval will be given to continue to the live trial at RAF Fylingdales in the second half of 2019. As with much current MOD funded work there is also a real interest how such developments can also be used in the non-military domain to help grow UKplc. As such we are also developing a “civilian” demonstrator of the concept and talking to business and other organisations about how this could help support their own employees, staff and even students. Writing to a slack channel. At Daden we use slack to communicate with other team members and as a way of passing useful information, jokes and items of interest around the company. An article on Code Project on how to communicate programatically with Slack grabbed my interest so for the February Daden U day I decided to see how difficult it would be to "talk to slack". From start to finish it only to about 15 minutes to have a simple example up and working, so a big thanks to Ryan Peden for writing the article. Now we are able to write to Slack the next step is deciding what we can do with it. At the moment thoughts are along the lines of getting notifications when web sites throw exceptions as well as integrating some of Daden's many chat bots. The first task has been just to re-establish existing functionality before we move on to new stuff. The LSL script reported memory errors (you only get 64k! ), so we stripped out the nice-to-haves and got the core working from bot to Corrade to LSL to Corrade to bot. To get the other functionality back in we have to use an old LSL technique of putting the extra chunks in a new script and then using the llMessage function to call with a set of parameters - very messy as you can't pass much, but still the only way to do it in LSL which has no concept of a script library, shared scripts, or a script to script API! The final bit was talking to Chatscript. 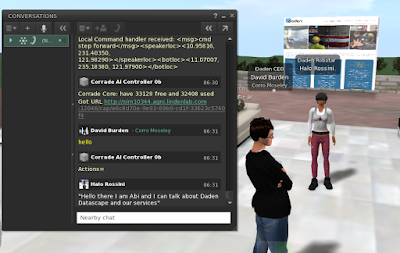 Iain sorted a plain REST API into our Chatscript environment, I uploaded the old Abi (our virtual receptionist) files to the server, and finally we had the whole path with a user in SL being able to ask the Abi/Halo avatar questions about Daden. Next steps are to start to build some of the Halo "brain" into Chatscript, porting some of our earlier Discourse work, and maturing the LSL interface. The aim is that by December 2019 we'll actually be beyond where we were with this in December 2009 when we were finalists in the BCS Machine Intelligence Competition! Daden MD David Burden, writing with one of our long time collaborators Prof. Maggi-Savin Baden from the University of Worcester, has just produced a new book on Virtual Humans. The book has been published by Taylor & Francis in New York and covers the technical, social and ethical elements of what makes a virtual human, and how these technologies might develop in the future. There is more information one the book, and updated content since this is a fast moving sector, at www.virtualhumans.ai, along with links to Amazon if you want to purchase a copy. 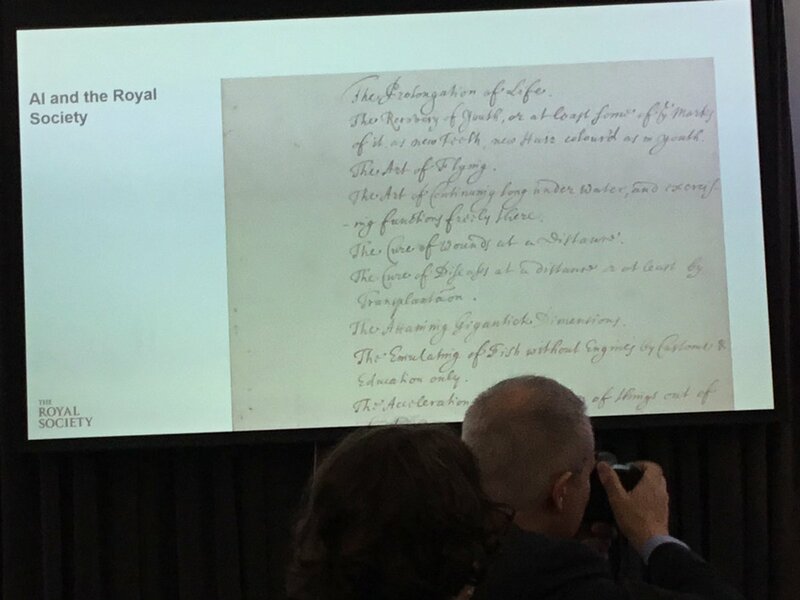 1) Kate Coughlan of the BBC presented some research they'd done on public attitudes towards AI - showing which areas excited people, and which they were wary of. Overall them seemed more wary than excited. Interestingly the notion of digital immortality came out as one of the few positives! 3) The Royal Society and Ipsos Mori also doing interesting public attitudes research. The Royal Society found that "only 9% of those surveyed had heard the term ‘machine learning’" - hence the AI catch-all! 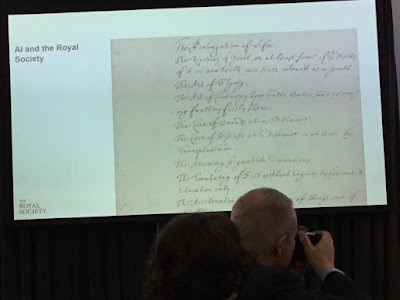 The Royal Society has also issues an AI Narratives report. All in all a great day, and certainly going along next year. A recent study by the Birmingham Community Healthcare (BCHC) NHS Foundation Trust found that after brain injury over 70% of patients reported a reduction in their ability to navigate and this had a major impact on quality of life. If you take a moment to think about all of the cognitive skills you draw on just for a simple journey, this can become quite a complex task for someone with difficulties in all of those skills. In an outdoor environment we often rely on tall distinctive landmarks to help us build a ‘bird’s eye’ or overhead map of the environment or we use local landmarks such as post boxes or shop fronts that help us learn a route using more of a ‘worms eye’ view. Prior research had already shown that people used similar navigation strategies in a VR environment as they did in the real world. So, in order to better understand way finding and route learning in people with acquired brain injury (ABI - e.g. 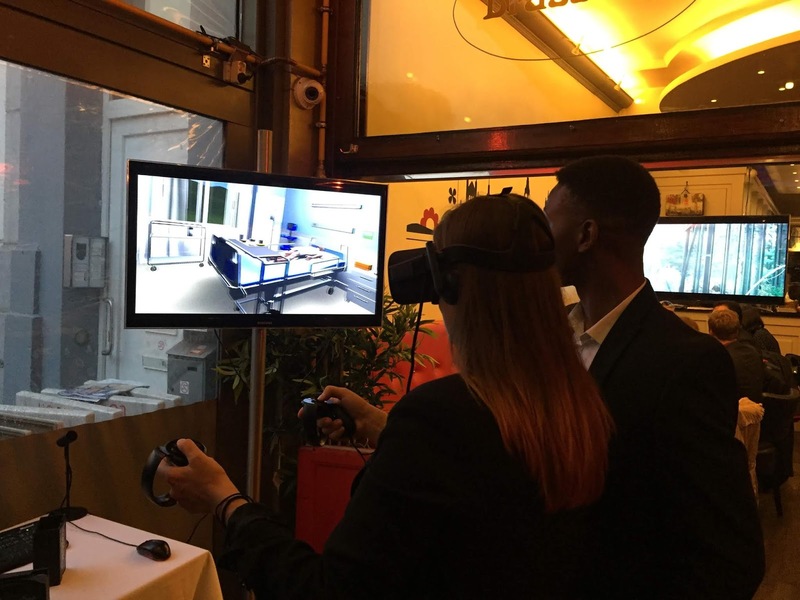 stroke and traumatic brain injury), BCHC asked us to develop a virtual simulation that patients and researchers could use – saving a massive amount of time on outdoor, providing greater control, and reducing risk. 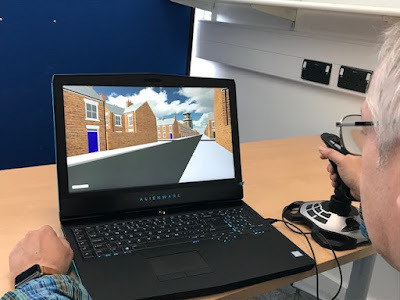 We created a network of identical streets lined with typical Victorian terrace housing, and gave researchers the ability to drag and drop distant landmarks (e.g. church spires, tower blocks) and nearby landmarks (e.g. pillar boxes, bus shelters) to create different route finding challenges. 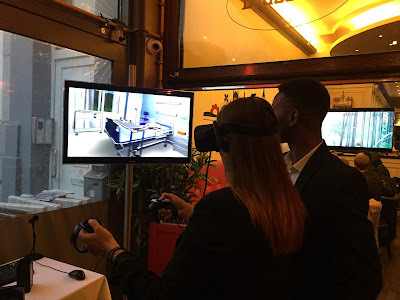 The researcher could then mark up the desired route with virtual arrows and let the patient learn the route from the landmarks, and then remove the arrows to see how well they could navigate with only the selected landmarks. The system has generated far more data than BCHC had expected. There are now two Doctoral students, two Masters students and two BSc students who have or are using the software in their research projects. Between them they have so far tested around 20 people with traumatic brain injury (TBI) and 30 to 40 controls for various projects. And the findings so far? One project looking at the impact of contact sports on route learning showed that female American Football players performed worse on recalling certain types of routes than student controls. Another pilot project showed that people with TBI perform worse than controls when only landmarks in the distance were available and BCHC is continuing to gather more data to see if this is supported. Another new project is even combining the virtual route learning app with a fMRI scanner! (c) 2017 Daden Limited. Picture Window theme. Powered by Blogger.